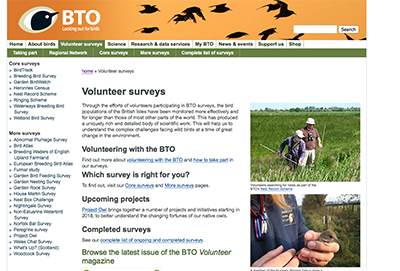 Wetland Bird Survey (WeBS) is the scheme which monitors non-breeding waterbirds in the UK. The principal aims of WeBS are to identify population sizes, determine trends in numbers and distribution and to identify important sites for waterbirds. Continuing a tradition begun in 1947, around 3,000 volunteer counters participate in synchronised monthly counts at wetlands of all habitat types, mainly during the winter period. WeBS is a partnership between the British Trust for Ornithology, the Royal Society for the Protection of Birds and the Joint Nature Conservation Committee (the latter on behalf of the Council for Nature Conservation and the Countryside, Natural Resources Wales, Natural England and Scottish Natural Heritage) in association with the Wildfowl and Wetlands Trust. Thanks go to everyone who helped. The BTO/JNCC/RSPB Breeding Bird Survey is the main scheme for monitoring the changing fortunes of the UK’s common breeding birds, generating population trends used to set conservation priorities. In Northumberland and Tyneside, over 70 1km squares have been surveyed since the survey began in 1994, many for over 20 years. The squares are chosen randomly and cover all available habitats, reflecting the percentage of land use in the area. After an initial reconnaissance visit in March to set up the transect route, two morning field recording visits are required: Early – April/May: Late – late May/ June, at least four weeks apart. All birds seen and heard should be recorded, as well as habitat details. There is also an optional mammal section to this. The object is to visit the site at the same time each year, or as close as possible, to enable comparisons to be made. This survey involves two early-morning visits through April, May and June to a randomly selected 1-km square, to count all the birds seen or heard while walking two 1-km transects across the square. Basic habitat details are required, with an option to record mammals. For those with free time later in the season another visit can be made for a Butterfly Survey. Northumberland has 120 1km squares assigned for coverage, with nearly 100 allocated. Below is a list of accessible available squares. Of you’d like to take part please either register with BTO on the BBS website or contact Muriel Cadwallender at tomandmurielcadwallender@hotmail.com. Monthly WeBs counts of waterbirds.